After the victorious offensives in the spring of 1918, in mid-August Foch decided to lead a general offensive with the aid of the British, the Canadians and the Americans. Under the command of General Ludendorff, the Germans retreated. At the end of September, the High Command became aware of the imminent defeat of Germany. American soldiers on board FT 17 tanks travelling towards the Argonne Forest on 26 September 1918. Ludendorff declared to Parliament: "It was not however the numerical weakness of the divisions which made the situation disturbing, but rather the tanks which appeared by surprise in very great numbers". He thus acknowledged the efficacy of this new weapon, especially when employed in numbers and supported by aviation. 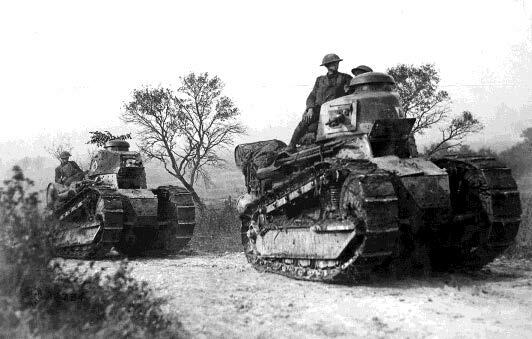 After the war, Germany undertook secret production of its own tanks and improvements to anti-tank weapons despite the prohibition in the Treaty of Versailles on the production of armoured vehicles. In 1939, it used them to invade allied countries in a few days.